Know your role when you deploy as the Support Class. The iconic Classes of Recon, Support, Assault, and Medic return in Battlefield™ V, each with distinct weapons and gadgets that help you forge a squad that can control any fight. 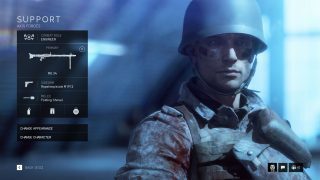 Battlefield V is also delivering more depth to these Classes with the introduction of Combat Roles, which bring a package of traits that give players more flexibility during battles. Today, we’ll focus on the Support Class, the soldier that keeps their squad supplied and fortified. A reminder: the game is still in development and all game features may be subject to change. We’ll update as necessary. Still have questions? Check out the upcoming Reddit AMA with three lead Battlefield V developers. The Support Class carries the weight of their squad as the mobile source of supplies and by toting the LMG or MMG – the big guns of Battlefield. They help their squad close the gap between objectives by keeping teammates resupplied. Support causes suppression, visually impairing enemies, briefly spotting them, and then wiping them out. While others are playing with boards and nails, as Support you’re building advanced Fortifications and machine gun emplacements. You can give your squad better firing positions, a safe spot to reload, and the best chance to capture a point when using your unique ability to construct stationary guns. Support Class weaponry is fit for close and medium range and typically has a high rate of fire, letting you lay down a steady stream of bullets for a long duration. The Support is equipped with tools for enemy suppression and a storm of heavy fire. Your Ammo Pouches supply your squad and balance against the new Attrition System. Your Anti-Tank Mine adds an extra touch to help defend fortified positions. Set per Class, more weapons and gadgets can be unlocked just by playing. Weapons can be customized as part of your Company. These are tied to Classes and provide two traits. Pick a Class and Combat Role with a loadout that suits your playstyle but be ready to make a switch at the deploy overview screen to adapt to on the ground situations. Each Class gets two Combat Roles at launch to choose from, with one equipped as a default, and the other unlocked by playing. 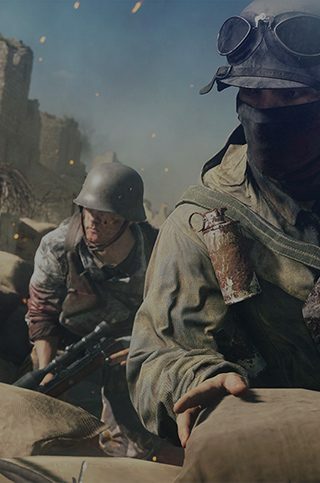 More will release as part of Tides of War, giving players enough time to master each before providing them with additional options to choose from. The Engineer Combat Role is the base for the Support Class. Soldiers look to you to lock down a location in a hurry, since you can build Fortifications faster than any other Class or Combat Role. You’ve operated oversized weapons since they day you enlisted and can fire from the top and port guns for a longer period before they need to cool down. So, hop into your friend's tank to man the gunner positions with unparalleled skill in the Engineer Combat Role. Then jump out to repair the vehicle at maximum speed when needed to stay in the fight. Vehicle Fixer: You repair vehicles and build Fortifications significantly faster than other Support Class Combat Roles. Heavy Weapons Expert: You can fire static weapons and mounted vehicle weapons for a longer duration before they overheat. With this Support Class Combat Role, you remain focused amid the wreckage your bullet showers create and can automatically spot enemies that you suppress for your squad to pick off. You’ve tamed those unruly Light or Medium Machine Guns and can suppress hordes of foes more effectively. Bullet Storm: You have increased suppression ability. Focused Fire: Automatically spot enemies when you fully suppress them. It's smart to go Support Class with some advice. Take these tips from Battlefield V devs. First, remember, the Engineer excels at building Fortifications at maximum speed. So, try this! Bring out your Building Tool to see where you can construct Fortifications. Keep a look out for the powerful stationary machine guns that only Support Class Combat Roles can build. A squad of Engineers can quickly build massive defensive structures to make it hard for attackers to push a point. 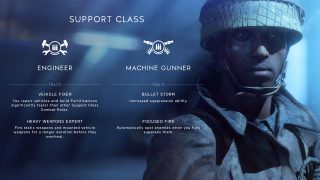 The second Support Class Combat Role, the Machine Gunner, is more about the handling of powerful LMGs and MMGs but still able to supply friends with vital ammo pouches. A good option when playing the Machine Gunner is to go prone with your LMG or MMG and deploy its bipod for increased accuracy. Then spray bullets in the direction of groups of enemies for a great chance at suppressing and spotting them.